This post is "off-topic", being a survey of the astrological chart of an individual whose political views were not known to the general public, and whose life was primarily one of not politics but music. Nevertheless, I suspect that this material will be of interest to some who may happen upon it by web search. The subject was a truly influential person in my life and an inspiration to those fortunate enough to have known him. Here I confine myself to a few biographical points and some observations on the birth chart. Should I write a longer tribute in the future, it will probably appear not here but on my personal site. Serban Rusu (March 31, 1943 -- June 24, 2015) was a Romanian-born violinist and violin teacher who moved to America in early adulthood and stayed for the rest of his life. He was a superlative violinist and a truly outstanding teacher who began his teaching career as assistant to Josef Gingold. Not content with merely imparting his vast musical knowledge, he never stopped innovating in search of new approaches to violin technique and new ways to teach. His former students who play professionally tend to dominate whatever context they work in, due to having received Serban's far-superior-to-the-norm training. They tend to display both exquisite technique and deep musicianship, and are a legacy of which Serban was justifiably proud. Not only was Serban a great music teacher but also an inspirational figure who taught everyone around him to live with both chutzpah and grace, a sort of Romanian "Zorba the Greek" or a Right-wing Robin Williams. He was, at turns, consummate artist and brilliant clown, Zen master and hedonist, philosopher and fool. He was often infuriating and always inspiring, deftly navigating in life, what he saw as an all-important balance, in music, between the vulgar and the sublime. His genius and his generosity could not help but enrich the lives of the many with whom he shared his great light. Even as he battled a crippling Parkinsons'-like disease in the last third of this life, he never lost his spirit, his optimism, or his drive to wring every last drop of experience from the time he had left. I don't have a time of birth for Serban, and do not have a precise location (he was born in a part of Romania that is now in Ukraine). Using a default time of 12 noon gives us many house placements which correspond well with his personal traits. I've taken the liberty of moving the proposed time of birth to 11:30am. This gives puts Jupiter rising (fitting his outsized temperament), the North Node in the Second (fitting his departure from Communism, his financial success, and his decidedly conservative politics), Neptune at the IC (reflecting his love of the water and nautical pursuits, and his determination to live by the ocean), Pallas at the MC trine the Ascendant (perhaps, prominent intelligence and physical agility), and Juno at the Descendant (perhaps representing his wife Kyoko, whose commitment to Serban was unwavering and total). In addition, using a "primary direction" technique, a time of 11:30am puts the Moon on the Descendant around when he relocated to the US and Mars on the Descendant when he married Kyoko. 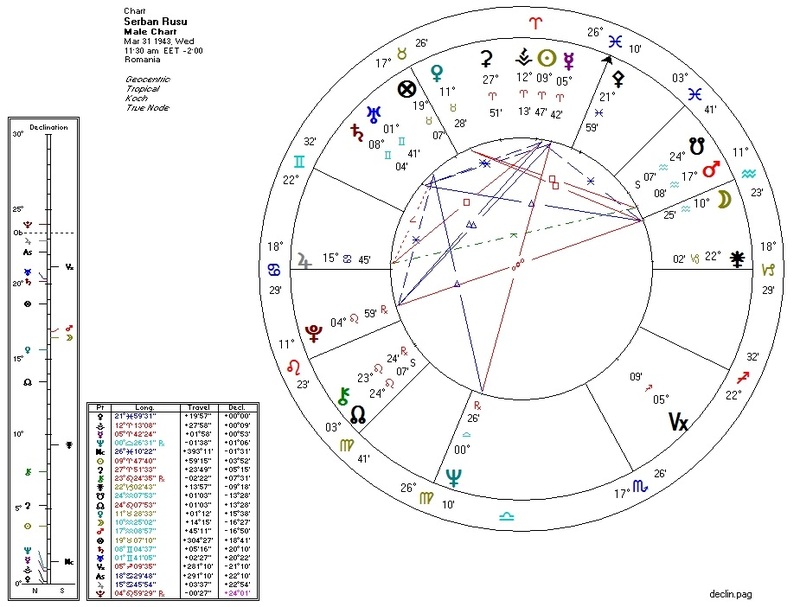 Finally, relocating this 11:30am chart to his home of Tiburon, California, puts his Sun in the Third House of communication (as befits a teacher), the Moon on the Second House cusp (his home was beautifully and lavishly decorated) and Saturn in the Fifth (he and Kyoko had no children of their own). I am no expert in rectification but feel "pretty good" about 11:30am. Great musicians tend to have mysterious/transcendent Neptune in relationship to one or both of the Luminaries and/or some equivalent configuration. Here we have the Sun widely opposite Neptune (bridged by helpful Mercury conjunct the Sun). Neptune is also conjunct the IC and sesquiquadrate Mars, ruler of the Sun. This gives us strong embodiment of Neptune's otherworldly powers without, perhaps, some of the pitfalls (such as delusional or self-destructive tendencies) that sometimes accompany hard Sun-Neptune aspects. Great instrumentalists, in my experience, also tend to carry a complex which combines Venus (art/aesthetics), Mars (action), and Saturn (structure/discipline). Here we have Venus square Mars which in turn is ruled by and trine Saturn. The violin is an instrument requiring great physical dexterity. In my experience this is indicated by connections from Pallas (intelligence/skill) to Mars and/or the Ascendant. This chart has a prominent Pallas at the MC trine the Ascendant. Jupiter in Cancer on the Ascendant: Serban was a generous and outspoken teacher (Jupiter on the Ascendant) whose primary activity (Ascendant) was to nurture and develop (Cancer) young (and not-so-young) musicians. Jupiter square Sun and quincunx Mars: this tense "fire planet triangle" seems to reflect his seemingly endless excitement and optimism... which would sometimes result in spectacular clashes with those around him. Sun conjunct Mercury in Aries in the Tenth House: aggressively communicative, brilliantly intellectual, and brashly opinionated. In a very public way. Pluto in the First House: while he would certainly nurture and inspire his students, he would also often dominate them. Saturn conjunct Uranus in the Eleventh House: perhaps representing his clashes with fellow teachers and with authorities in educational institutions. Serban was an ardent anti-Leftist and would delight in verbally tearing down modern-liberal ideology. to the chagrin of his liberal California students. No doubt some of this sentiment came from his first-hand view of the Communist horror of his native Romania. It also appears strongly in the chart. Libertarian: Pallas parallel Mercury; Pallas co-ruler Jupiter square Sun; Pallas co-ruler Neptune opposite Mercury. I can't recall a single case in which a mundane square between Pallas and one of her "enemies" was the deciding factor in a political reading. My suspicion is that Serban might have eventually become a full-on libertarian had he been more interested in the nuts-and-bolts of political-economic theory. Capitalist: North Node in the Second House; Venus in Taurus. Not a Socialist bone in his body. More Ayn Rand than Rand herself, astrologically speaking. Not a cultural conservative. He had no particular drive to preserve any traditional culture outside that of classical music. From the chart, Serban's Right-wing affiliation comes from a libertarian/anti-authoritarian streak and a strong sense of private property ownership. Sometime around 1990, Serban began experiencing significant symptoms resembling Parkinson's Disease. I remember that it started with a persistent tremor in his hands and eventually progressed to a near-complete inability to control his movement. Around this time, primary direction would have placed the North Node at his Ascendant (karma plus movement) and the Huber Age Point would have been near his Mars / South-Node conjunction. His progressed Moon would have been parallel with his progressed Mars, two years before which he would have experienced a triple-parallel of the progressed Ascendant, MC, and North Node. The natal chart also carries many suggestions regarding the nature of the malady. Many of these aspects are not necessarily disastrous on their own, but the sheer number of them does suggest problems. Mars (ruler of Sun) conjunct South Node: eventual loss of physical power and masculine energy, which is strong to begin with. Mars sesquiquadrate Neptune: the occultation or disappearance of physical energy? Neptune opposite Sun: drained vitality. Neptune opposite Mercury: potential trouble with the hands and/or communication? North Node conjunct Chiron: possibility of injury/debility later in life. Saturn conjunct Uranus in the Eleventh House: difficulties with the nervous system (Uranus). Huber Age Point conjunct Ascendant: start of a new cycle. Transiting Pluto opposite natal Jupiter: ending/transformation of a journey. Transiting Pluto trine natal Venus: a great gift bestowed. Transiting Uranus square Ascendant and conjunct solar arc Moon: interruption in life force. Transiting Chiron conjunct natal Pallas and quincunx natal Chiron: injury/struggle with intellect. Transiting Ceres conjunct Moon and sextile Sun; solar arc Ceres quincunx Moon and square Sun: The Ceres/Sun/Moon triad is often present when persons are kidnapped or taken away. Transiting Mars in the Twelfth House square natal Neptune: activation of a mystery. Transiting Venus and Jupiter conjunct natal North Node: a major boon received. Progressed Venus conjunct natal Pluto: value destroyed or massively amplified, or both. Progressed Moon and solar arc Jupiter conjunct IC: an ending and a new journey?